Raising the bar in digital flatbed printing. ULTRA is available in three models to fit any budget and is field upgradeable to allow for more capacity as your business grows. 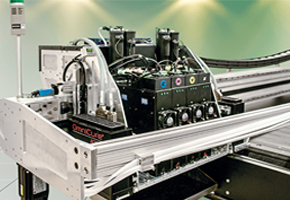 Advanced UV LED curing and ink technology delivers low temperature curing and reliability without sacrificing print speed, color gamut, ink adhesion or media versatility. The ULTRA, redefining the digital flatbed market. Three print head configurations to choose from.